Marni is a line that I never quite know what to expect of. Sometimes it's straight up street, and sometimes far more sophisticated. That kind of design versatility is unpredictable, but fun. 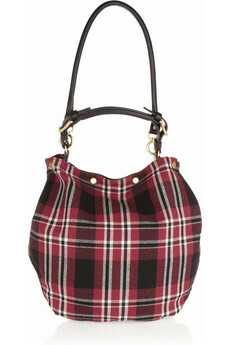 This wool and leather hobo is a pretty in punk slouchy style that makes me want to keep a close eye on Marni. I kind of hate hobos. Stuff is always getting lost in them, they're heavy, and I don't really need to carry that much anyways. But something about this hobo is really intriguing. First of all, although it doesn't actually have a flat bottom, it looks more like a bucket bag than a hobo. Perhaps it's the slim strap combination? In any case, it's cool in a '90s punk revival way that is super hot right now. The plaid could go either way though. This cool red check pattern will look at home with combat boots and a shaved head or a totally conservative beige ensemble. How many bags can you say that about? The fabric also keeps the bag from being as weighty as its leather counterparts, which is a major bonus in an accessory of this size. All in all, it's not terribly practical but it's still a winner in my book. At $950, this bag is also well priced for the designer realm. Who could ask for more? The Marni Slouchy Shoulder Bag, a great alternative to this bag.